After a few weeks of not making it to Publix on my usual Thursday afternoon, I was finally able to get back in the swing of things today. With all we have coming up/going on between Memorial Day weekend, My sister's wedding and the last few days of the school year, we probably won't be eating at home much in the next week or so, and I almost considered skipping shopping this week. I really wanted to take advantage of FREE hummus, stock up on yogurt, and grab some BOGO sour cream for making Champagne Cupcakes next week. Since I got salad and veggies earlier this week and we had eggs, milk and meat in the fridge and freezer we didn't need anything else. 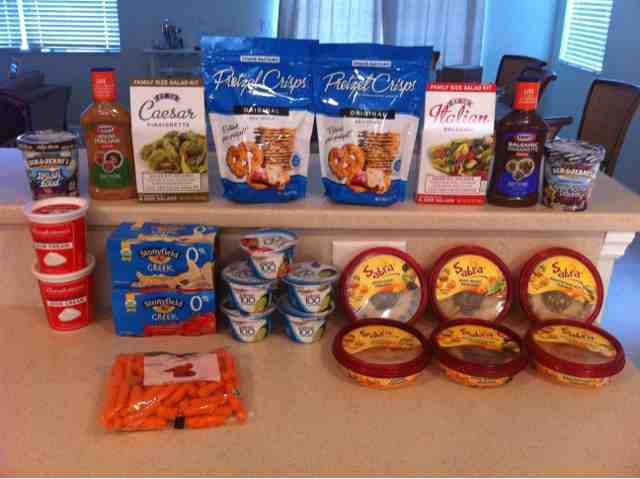 I used a $5/$30 Winn Dixie coupon as always to lower my totals. Even with two shopping trips this week I still spent less than $40 this week so I am happy with that. Don't forget to enter my $25 Publix gift card giveaway before it ends tomorrow night!